In Facebook there are just oodles and oodles of groups... networking, selling, swapping and now colouring. A friend started a group for those of us in southern Adelaide... some are even meeting in cafes, drink lattes and colouring in :) Its a fabulous life! Once a month there are challenges as well. This month (July) is to colour this image using only 5 colours. I don't know where she got the picture from but it is copyright to somebody... thank you to whoever designed this drawing :) Its interesting to colour. Haven't decided if I'll add water yet. I'm liking all the grainy pencil marks so might just leave it as pencil. Why not join us? Look for "Southern Colouring" in Facebook. A few have uploaded a pic of their version and they look fab! 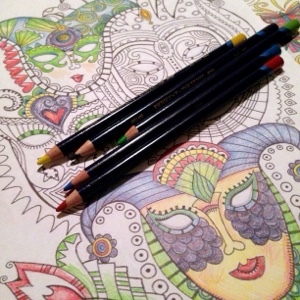 Its fun and relaxing to colour plus it helps encourage the brain to mess about with different colour combos. Have fun and happy creative day!